This beautiful big mare has produced stunning foals without exception. She herself is an imposing 17.1 hands, bright bay with a blaze, 17 years old and beautifully put together. She was purpose-bred by APH and is an exciting combination of imported Trakhener and Spanish blood, which has produced amazing movement and suspension. 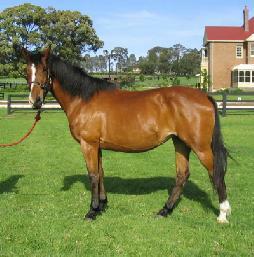 Cienta performed successfully to Medium level dressage before being put to stud. Her first Visage foal, Vienna, was a solid-coloured filly and unquestionably the tallest baby we have yet produced. Fortunately she is also perfectly proportioned and she takes your breath away when she moves. Cienta's second Visage foal, Vortex, a gorgeous coloured gelding with LOADS of chrome, looks set to grow even bigger.